Here's one to put in your Wish List for Christmas, or even a Christmas in July, so you don't forget about this book! 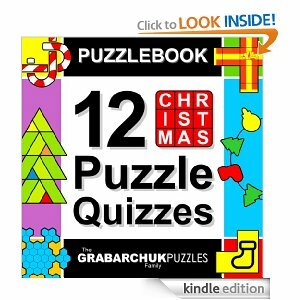 This truly is a great Puzzlebook that really gets you in the mood for the holiday season because all the puzzles are all in the shapes of holiday themes, such as snowmen, christmas trees, stockings, bells, bows, stars and more. This one is great for yourself, and to give as gifts to everyone on your christmas gift list! Great as a stocking stuffers, too, as the kids and everyone will like these a lot. While you're playing these puzzles, you're going to find yourself humming Christmas Carols to yourself! This is also the kind of book you need to have in order to escape that hussle and bussle of all the holiday work you have to get done and to take time to enjoy the season for yourself for a little while. I often like a little 'Christmas in July', too! July is a great time to revisit the Christmas holiday, and it's all yours to enjoy! Nothing to be done but to revisit the spirit of joy the season brings. So while you are sweltering in the heat, perhaps these puzzles can help cool you down a little as you think of the snow in December and the joy of the season. These puzzles, just like all the other Puzzlebooks this family has made, are all visual puzzles to solve. Even though it is not Christmas as this moment, I still had a lot of fun solving these, and you will too! Again, these puzzles are for the Kindle and ALL the other devices that support the Kindle App. Don't forget about The Cloud! All your devices that can access The Cloud can access this book, too. The Cloud is great, isnt' it! This book holds 12 puzzles of different varieties of visual puzzles to solve. In my case with the Kindle Keyboard 3G w/ WiFi, I use the 5-way Controller to move around. With the Kindle Fire it's the Touchscreen to move around the puzzles to solve. The Grabarchuk Puzzle Family does a marvelous job with every book of visual puzzles they make. In my opinion, they are the best at what they do. You cannot find any better puzzlebooks than theirs. So grab a copy of this book, add it to your Wish Lists, and enjoy it! Another GREAT book of visual puzzles to add to your collection! Here's the link for you to purchase this book!